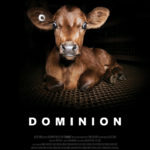 Dominion is an eye-opening film that many people don’t want you to see. Fortunately, Director Chris Delforce does, and he created an incredible documentary that exposes the ongoing atrocities committed by modern animal agriculture. Narrated by Joaquin Phoenix and Rooney Mara, Dominion is a hard-hitting documentary that has won multiple awards for its writing, directing, and music. For some, realizing the origin story of what we once called food is a difficult process with many stops along the way. Dominion is a two-hour wakeup call to those still consuming animal products as well as to those who are not. In anticipation of the Twin Cities premiere screening of the documentary this weekend, we compiled some of the reviews the film has received. This is the most important film you will ever watch. This documentary is a shocking expose of hidden violence behind our food system. Dozens of people had to step out of the theater where I saw it in San Francisco because they could not face the actual real-life footage of what happens behind the walls of animal farms and slaughterhouses. The filmmaker had his house raided by the Australian government and faced repeated threats for releasing this footage. This documentary is going to turn the world upside-down. The filming techniques are staggering in their construction and the crew’s unwavering commitment to reveal the darkness is worthy of the utmost admiration… The film’s core value is to make us think about our relationship with the animal kingdom and assess the power we use (and abuse) but more than that, through the viscera stained graphic footage and lingering power, Dominion exposes how we need to grow, we need to improve and frankly, we need to wake the hell up. This documentary will open your eyes to the truth about the ‘food’ you choose to eat. It explodes the myth of ‘humane slaughter’, show the reality of ‘free range’ and every day farm practices and animal agriculture in Australia, but common around the world, as well as some other practices that occur in other countries to bring us in the West, our ‘creature comforts’ like down pillows and fur coats. The undercover footage that was bravely obtained by activists and painstakingly put together for this film, along with the drone footage, has some of the most moving and powerful scenes portraying the suffering and horror that is the life and death of farmed animals. Especially if you still consume animal products, have the courage to watch this film and see if your choice to do so really stacks up as a good reason to do something that requires so much suffering, and creates so much waste, greenhouse gases and poor human health outcomes. Whatever your views on eating meat this film will surely make you think hard about the life choices you make and what we can collectively do to be kinder to the animals we share this world with. To experience Dominion for yourself, join us this Saturday at 1pm in Coffman Memorial Hall for the Twin Cities premiere screening. Learn more about the screening here and buy tickets here. If you’re a vegan, you’re likely to have been asked a question like this at some point in your life. When I first adopted a vegan lifestyle, I seemed to get several questions like these per day. Usually, they were fairly easy to answer: I would eat whatever the animals eat. I wouldn’t eat the egg. I would do what I could to help the cow, but still not drink the milk. Over time, though, it can become annoying and tiresome to answer. Maybe it’s because of the absurdity of the scenarios these questions are constructed around, or maybe it’s because they are desperate to find a situation where the consumption of animal products is unquestionably okay. Either way, it’s always a good idea to avoid being outwardly frustrated when faced with these questions. While it’s possible that the person asking you this may be trying to mess with you, it is also very possible that they are genuinely curious about the specifics of being vegan. Connecting to your ethical or other “why” helps reinforce your own personal answer to questions about how far your veganism goes. Find what your personal answer to that question might be and practice being confident in speaking it. This should hopefully provide an answer to any question in the “What if…” style. And if you find yourself in the position of being asked a question like this by someone, consider whether or not it’s a situation where you might feel comfortable inviting the person to join you for a plant-based meal or activity. A little bit of conversation and community can go a long way in creating more understanding in friends and family about why living your lifestyle is important to you. If you are someone, currently plant-based or not, who has asked this type of question in the past, don’t worry. It may have been a frustrating ask but it’s in the past. In the future, though, if you’re really wondering about the limits of someone’s lifestyle choices, just cut to the chase and ask, “Is there a situation where you would eat meat or animal products?” and they’ll tell you. No further questions needed. Recap of 2018, Looking Ahead to a Strong 2019! It’s no secret that 2018 was a huge year for the vegan, plant-based, and animal rights movements around the world. The availability of plant-based, cruelty-free foods increased globally and in the US, protections for animals expanded with the passing of Proposition 12 in California and a vote to end greyhound racing in Florida. In Minnesota, over six (vegan!) restaurants opened or went entirely vegan, three all-vegan food trucks started driving around the Twin Cities, and Twin Cities Veg Fest became the largest veg fest in the Midwest! And we can’t forget to mention that Minneapolis was named Veg News’ 2018 City of the Year. 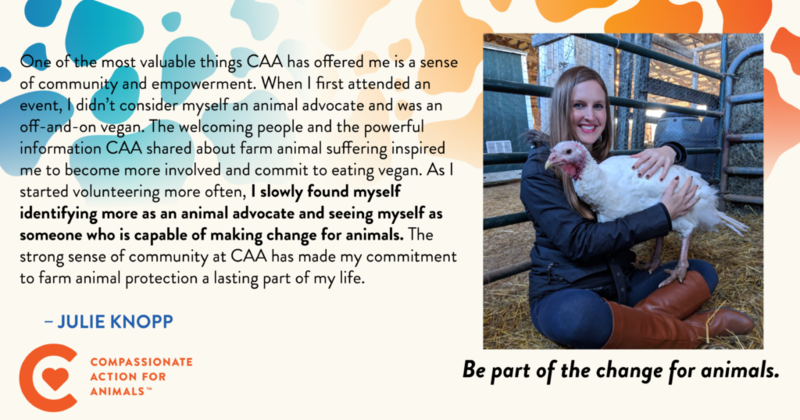 CAA’s mission is to encourage people to embrace their empathy for farmed animals and move toward a plant-based diet. 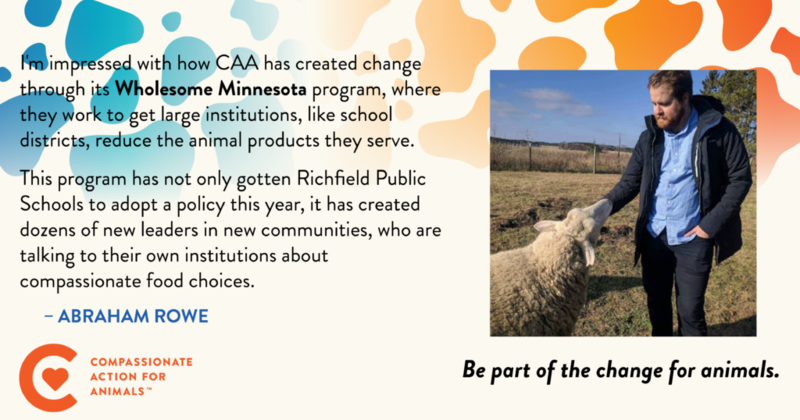 We do this through increasing awareness of farmed animal suffering, building community with plant-based eating, and nurturing advocates in the Twin Cities region. Our work is made possible by your support. We are so grateful for the record number of new donors this year as well as our past and current donors. We are deeply grateful to co-founder Matt Mackall for his exceptional year-end matching gift, which will create a lasting legacy for the animals. Finally, we extend a huge thank you to all who shared their stories, volunteered, and donated in 2018. You make this work for the animals possible and we can’t wait to see what we accomplish together in 2019. Dulceria Bakery is a new immigrant, woman of color-owned bakery creating high-quality artisanal pastries, cakes, and desserts with a Mexican twist. Dulce Monterrubio opened her storefront in 2018 after selling her pastries at the Linden Hills Farmers Market and other pop-up events. 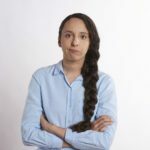 Today, she uses her space to focus on building a community of intersectionality and inclusivity for her customers, employees, and partners all while serving up incredibly delicious Mexican pastries. Sanchez Brown and Yunuén Ávila, program coordinators of our new Explore Veg Mentor Program have frequented the bakery since its open. As her bakery has grown into its new space, Dulce took a trip to Mexico last winter to complete a five-week intensive course at Escuela de Gastronomía Mexicana, a culinary school that focuses on traditional Mexican cuisine, as well as explore the vegan bakery scene in Mexico City. She’s taken her expertise and run with it, creating innovative twists on classic pastries. 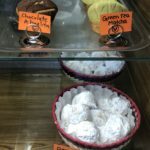 Everything in their bakery is clearly labeled as vegan, gluten-free, or otherwise and a large selection of delicious pastries are available daily. Every Saturday, Dulceria hosts a pop-up from local businesses that don’t yet have a space of their own. Dulce plans to add lunch items to their regular menu. If you’re looking for a filling sweet or savory treat, try one of their warmed empanadas in store! Dulceria Bakery is located at 1839 E 42nd Street in Minneapolis. In the winter, they are open 8:00 am – 2:00 pm Wednesday through Sunday and closed on Monday and Tuesday. CAA welcomes Mitch Thompson to our Board of Directors. 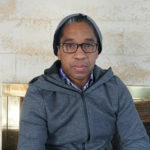 Mitch joined the CAA board in December 2018 after working intensively on the Twin Cities Veg Fest 2018 planning committee earlier last year. 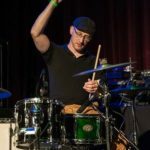 When he’s not working with CAA, Mitch works in the Twin Cities video production industry managing equipment rentals and is the drummer/manager for internationally known local ska-band Umbrella Bed. Stories about family and friends parents being “rotated off the kill-line” because they became desensitized to killing resonated with Mitch as a teenager as a horrifying situation––and that was only addressing the human part of the equation. 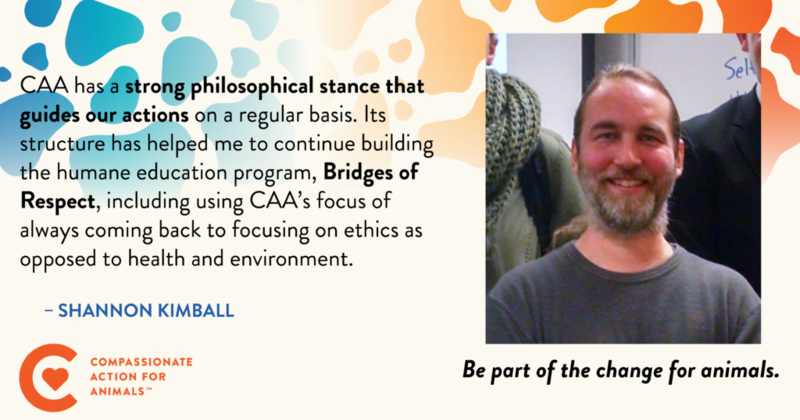 He maintains the core values of an organization like CAA will be critical positions for humanity to adopt more broadly to continue on. We’re excited to welcome Mitch onto the board and are grateful for the time and passion he’s put into our events so far. If you see him at an upcoming outreach or community event, be sure to say hello! 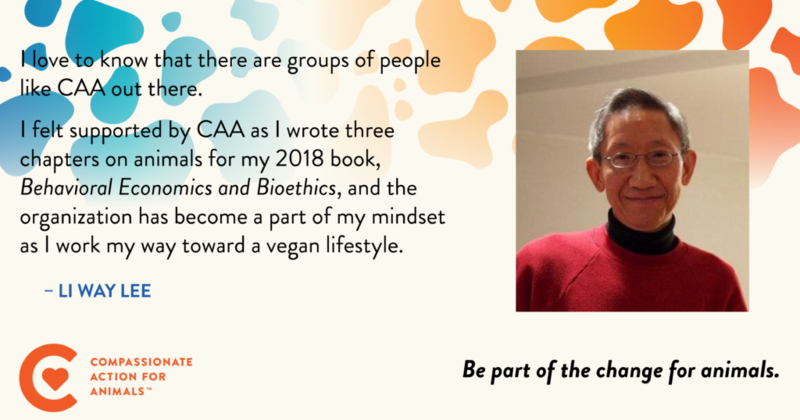 CAA in 2018 – What A Year! 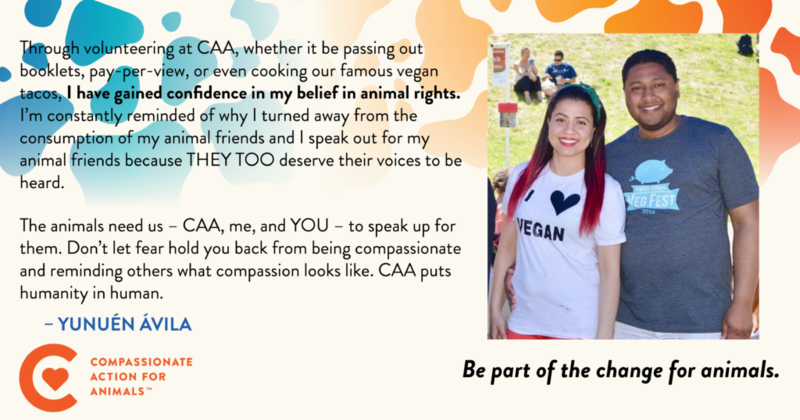 What a huge year for the plant-based, animal rights movement! California passed Proposition 12, which will require an increase of space for farmed animals and result in cage-free conditions for animals living across the country. More and more plant-based options are being developed and carried by retailers recognizing the plant-based trend, increasing widespread availability for consumers. In Minnesota, Minneapolis was named Veg News’ City of the Year, over nine plant-based restaurants opened around the Twin Cities metro, and two more went vegan! We welcomed a record number of attendees at this year’s Twin Cities Veg Fest, had a blast at all of our events, revealed a new brand identity, and launched not one but TWO programs this year––Wholesome Minnesota in January and just yesterday, the Explore Veg Mentor Program! From community building to outreach and activism, our growing community is special. 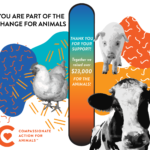 Change for the animals starts with supporting compassionate, plant-based choices and if 2018 is any indication, we can accomplish a lot together. We hope you’ll enjoy remembering everything that we’ve done together this year while watching our 2018 Year in Review video and that you’ll join us at our last event of the year––our hotdish-themed December Holiday Potluck, this Saturday the 29th from 12–2pm at the Matthews Park Recreation Center. 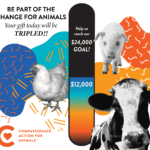 If you haven’t already, please consider giving today to help continue strengthening and expanding our work for the animals and a growing plant-based community. Announcing… the Explore Veg Mentor Program! Are you thinking of stepping into plant-based eating? Or are you already plant-based and want to provide support to someone looking to make a similar change? 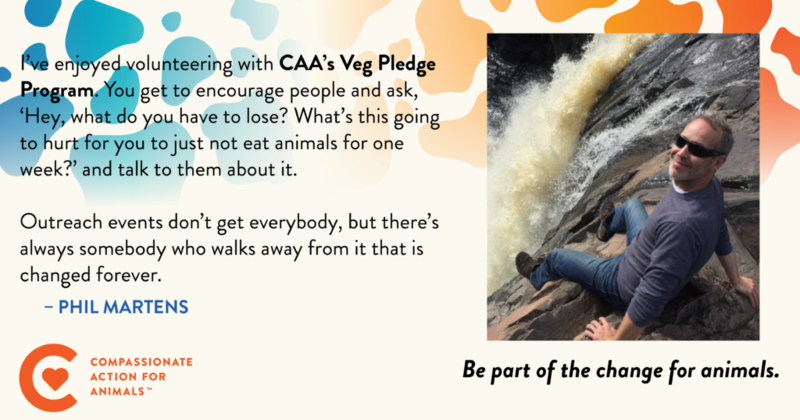 Look no further, because CAA just launched a brand new program geared toward supporting veg and veg-curious individuals on their plant-based journey. Meet the Explore Veg Mentor Program! The Explore Veg Mentor Program was designed to help individuals reach their plant-based goals, whether it be adding a few more veg meals into their week or going full-on veg. We all know it’s easier to reach your goal with someone rooting for you in your corner! 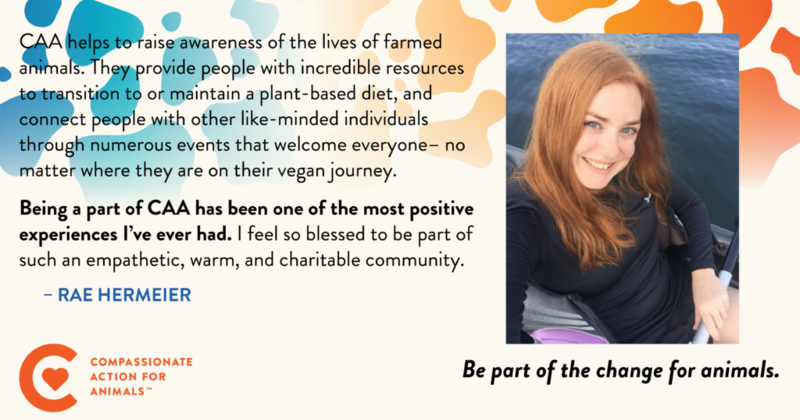 We pair mentees looking to make a plant-based change in their life with a mentor who has already gone through the process of learning about and living the lifestyle choices they’re contemplating. 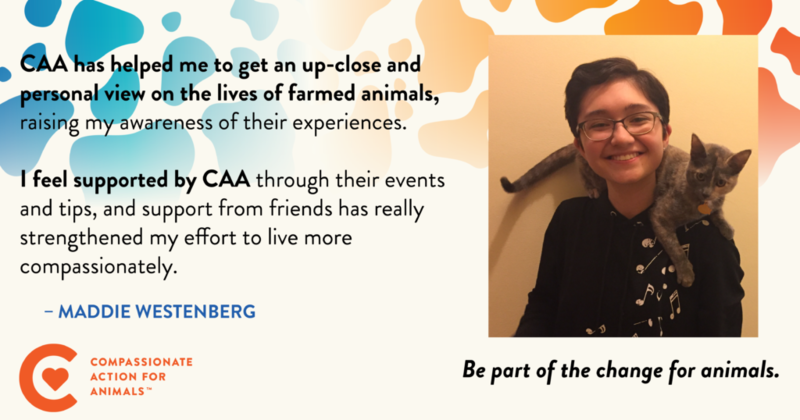 Each pairing lasts three months, during which time the mentor and mentee team aim to be in touch with each other at least every two weeks and participate in at least one CAA event (this could be a potluck, dine-out, or another event). We encourage teams to do things such as share recipes, eat together, go grocery shopping together, and share blogs, videos, or books with each other. For more information on the Explore Veg Mentor Program, visit our program page. To start your application, we’ll ask you to fill out a brief questionnaire and will be in touch with you about further steps within two weeks. We’re currently accepting applications for mentors and mentees. You can also attend our January Potluck: Starting Out Plant-Based, where we’ll share tasty vegan food and meet volunteer program coordinators Yunuén Ávila and Sanchez Brown on Saturday, January 12 from 12:00pm – 1:30pm. Volunteer Shoutout: Thank You 2018 Volunteers! You make our work possible and the impact shows––this year, Minneapolis was named Veg News’ City of the Year, over nine plant-based restaurants opened around the Twin Cities metro and two more went vegan, and we welcomed a record number of attendees to Twin Cities Veg Fest (just to name a few). This huge progress confirms that more and more people are learning about the horrors animals are subjected to in the agriculture industry and are hungry for compassionate alternatives. 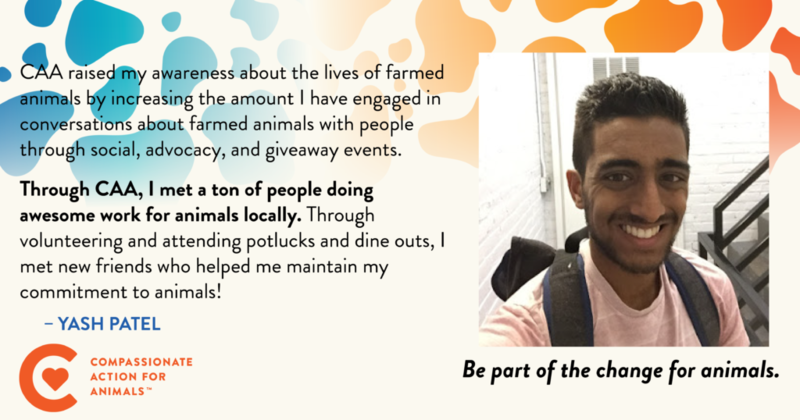 If you’ve been following us on social media this season, you may have seen some CAA stories shared by volunteers and community members. In the case that you haven’t (or if you’d like to see them again!) we compiled a number of stories shared with us this season. We loved reading about how these individuals have connected with work they’re passionate about, been impacted by the Twin Cities community, and how in turn we have been impacted by you! 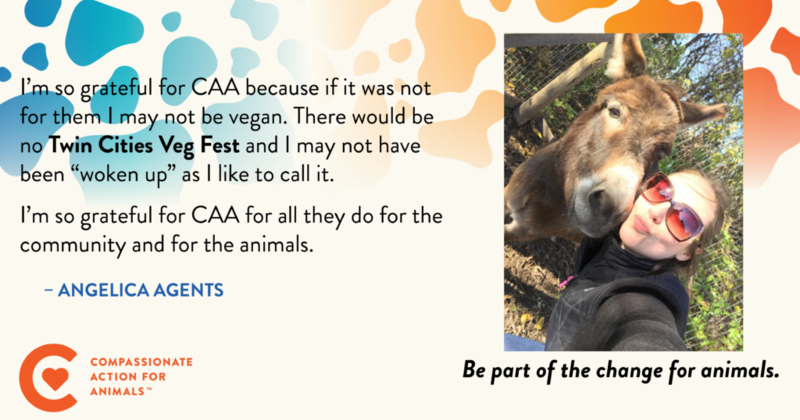 Thank you for sharing your passion and dedication to the animals this year.